Most Americans get enough protein in their diets, but there are some people for whom additional protein is needed or who might have to work a little bit harder to meet their daily and weekly needs. For some, it may be difficult to consume enough protein due to a decreased appetite or interest in eating, while others choose to increase their intake specifically to encourage growth and development. Some lifestyles and dietary patterns also require more creativity in meal planning and cooking to make sure protein needs are met. Who can benefit from additional protein? Children who are underweight are in need of a nutrient-rich diet. Allowing them to consume empty calories from less healthy foods will help with weight gain, but will not give them the proper nutrients needed to keep them healthy during growth. Healthy sources of protein can aid in both growth and muscle development. Bodybuilders or those performing resistance training or strenuous endurance exercises also need more protein. The protein is used to help repair and rebuild the muscles that have been damaged during a workout. Without enough protein, the muscles will not have the building blocks necessary for recovery and growth. Older individuals require more protein as well. Beyond age 14, the Recommended Dietary Allowances for protein remain the same, and therefore do not reflect the increased protein need of older individuals. However, it is known that as individuals age muscle loss increases and muscle growth decreases. This muscle loss is known as sarcopenia and begins around the age of 50. The rate of muscle loss can be slowed by incorporating good quality protein accompanied by physical activity. Vegetarians and/or Vegans need to plan their meals carefully to make sure that they get enough protein. Without the concentrated proteins found in animal products, those following vegetarian diets need to make sure that they are having enough of the plant-based proteins they rely on to meet their needs. So how can you get more protein into your meals? Look for as many ways as possible to add it in creatively to every meal, including dessert. Adding protein to desserts will increase the overall protein content of your food, helping you meet your daily goal. It also means you don’t have to worry about relying on protein-heavy main courses because your dessert will be just as satisfying. The protein added to your desserts will also help replace some of the processed sugars and flour commonly used. This will cut down those extra calories, and keep you feeling great by satisfying your cravings in a more nutritious way. Three great ways to add protein to desserts are with the use of tofu, beans, and Greek yogurt. Tofu is made from soybeans and is a great complete protein source, containing all 9 essential amino acids. It is an excellent source of calcium and iron. Tofu comes in multiple textures (extra firm, firm, and soft) and the different textures have varied uses. The extra firm and firm tofu can be used in a stir fry, baked, grilled, fried, or crumbled. Soft tofu has a creamier texture that is easy to blend, making it a great substitution for higher fat dairy products. Silken tofu stars in these recipes for Mexican Chocolate Pudding (recipe below) and Mind-Blowing Vegan Chocolate Pie from the blog Pinch of Yum for a great dairy-free alternative with a lower saturated fat content. Beans such as chickpeas and black beans are as healthy as they are economical. They contain protein, fiber, B vitamins, folate, and antioxidants. These rich Black Bean Brownies from the Chocolate-Covered Katie blog and my Chocolate Chip Chickpea Cookie Dough Bites (recipe below) are a must-try! Plain Greek yogurt contains less sugar and about two times more protein than regular yogurt. It is also packed with probiotics, the good bacteria in your gut that help out your digestive system. Nonfat plain Greek yogurt can be swapped for high-fat ingredients in recipes, such as cream cheese, sour cream, or mayonnaise. This will not only cut calories, but it will reduce the saturated fat content as well, while adding a significant amount of protein. 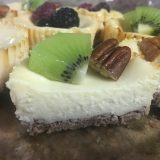 Check out my mother’s recipe for rich Greek Yogurt Cheesecake and Cook Learn Live’s delicious Yogurt Blueberry Fool, both made with nonfat plain Greek yogurt. Both recipes are below. Enjoy these satisfying and delicious protein-packed treats. I find that the best feeling is to eat something that tastes amazing, and is also nutritionally good for you. Warning: These recipes may end up replacing your classic dessert recipes. Feel free to try substituting these ingredients into your favorite recipes to see what dessert variations you can come up with! Guest Author Yocheved Millman, MS, is a dietetic intern at Hunter College School of Public Health. She loves experimenting with healthy cooking and baking in her spare time. Rich, dark chocolate. Very little sugar. A pinch of chili powder. Easy to make in the blender when chocolate cravings strike. Oh, and dairy free thanks to silken tofu. If using the sugar combine it in a small pot with 3/4 cup water; bring to a boil and cook until sugar is dissolved, stirring occasionally. Cool slightly. Skip this step if you are using the agave nectar or honey. Put the chocolate in a glass or plastic microwave-safe bowl. Cook for 1 minute on high power, then remove the bowl and stir the chocolate until it is completely melted. It may be necessary to return the bowl to the microwave and cook for an additional 15 to 30 seconds at a time to help speed the melting. Put the tofu, sweetener, vanilla, spices, and melted chocolate into a blender and purée until completely smooth, stopping machine to scrape down its sides if necessary. Divide among 4 to 6 individual ramekins and chill for at least 30 minutes. If you like, garnish with chocolate shavings before serving. 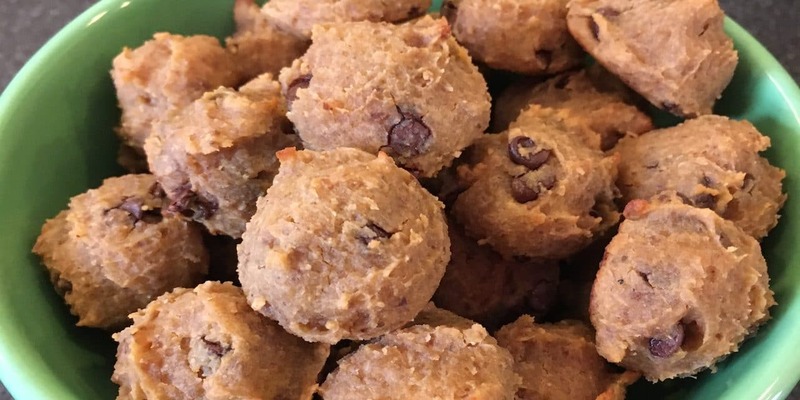 This recipe is a delicious treat that is packed with a variety of healthy nutrients and contains no flour, eggs, or oil. The chickpeas and nut butters provide a great source of fiber and protein, and the flaxseeds provide heart-healthy omega-3’s. The batter bakes up nicely into rounded cookie bites with gooey centers, or just eat it by the spoonful! Combine all ingredients except the chocolate chips in a food processor or high-speed blender and blend/pulse until well combined. Use a spatula to scrape the sides down and blend for another minute, checking the batter to make sure that there are no chunks or pieces of bean skin visible. The finished dough should be very soft and sticky. Transfer the dough to a bowl, fold in the chocolate chips, and refrigerate for 30 minutes. The dough can be eaten as is or shaped into balls for baking or freezing. To bake, preheat oven to 350 ˚F. Use a 2-inch scoop or a tablespoon to portion the cookie dough. Drop the dough onto a parchment lined sheet pant, rolling the dough into balls if desired. Place cookie sheet in the center of the oven and bake for 15-18 minutes, until the bottoms are golden brown. The cooke bites should be slightly firm on the outside but still soft to the touch. Remove the tray from the oven and let the cookie bites cool on the tray. To freeze, shape the dough into balls as for baking and place on a lined sheet pan. Place the tray in the freezer until the dough is firm. The dough balls can then be stored in a zip top bag or airtight container. Frozen dough balls can be eaten as is or baked directly from the freezer following the baking instructions above. Make mini cookie bites by using a 1-inch scoop or a heaping, rounded teaspoonful of dough. Bake for 12-14 minutes. For a stronger peanut flavor, feel free to substitute some or all of the almond butter with peanut butter. For a lower fat option, 3 tablespoons powdered peanut butter with 1.5 tablespoons of water works well in place of the regular peanut butter. The honey can be substituted with equal amounts of other sweeteners such as maple syrup or stevia. These light and creamy cheesecake bites are the perfect size for dessert. You would never guess, but these bites are packed with protein from Greek yogurt with absolutely no compromise on taste or texture. This recipe is made with a heart-healthy nut crust, making it gluten free, as well as a great addition to your Passover menu! Preheat the oven to 325 ℉. Using two standard muffin tins pans, line 15 cups with paper cupcake liners. Spray the insides with cooking spray and set aside. In a bowl, use an electric mixer on high speed to beat the egg white until stiff. Fold in the ground nuts and sugar. Press a spoonful of the nut mixture into the bottom of each cupcake liner. Bake for 10 minutes, then take the muffin tins out of the oven to cool. In a mixing bowl, use an electric mixer on medium speed to beat the cream cheese, Greek yogurt, and sugar until smooth. Add the eggs, beating in one at a time, and the vanilla and make sure all is well combined. In a smaller bowl, combine the potato starch or arrowroot with the milk and mix until dissolved to prevent lumps. Add the milk mixture to the mixing bowl and beat until completely smooth. Distribute the filling into the prepared crusts in the cupcake pan. Bake for 30 minutes, or until the centers are mostly set. It is ok if they are still a little bit soft at the very center when the pan is removed from the oven. They will harden as they cool. Allow the cheesecake bites to cool off completely in the muffin tin, then refrigerate until served. Feel free to substitute any other nuts for the ground pecans in the nut crust. Try walnuts or almonds. For those with a nut allergy, or for an even lower fat option, the nut crust can be omitted completely. 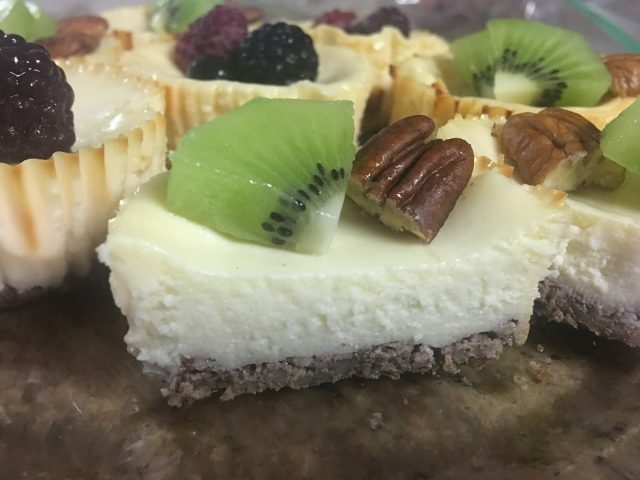 Feel free to decorate the top of the cheesecake bites with berries, fruit, or nuts for a decorative look. This recipe also works well as a whole cheesecake. For a 9-inch round pan, double the recipe and increase the baking time to 1 hour. This is a simple and delicious dessert made with lightly sweetened blueberries combined with a whipped cream and high-protein yogurt base. It’s also a great way to get in an extra serving of antioxidant-rich fruit, while limiting added sugars. Serve in individual stemmed glasses with some fresh berries and a spoonful of lemon curd on top for a fast, elegant dessert presentation—or feel free to make it all in one glass bowl and serve family style! Combine the blueberries, water, and honey to a small saucepan. Warm over low heat, then simmer until just starting to soften and burst, about three to five minutes. Crush the berries roughly with a fork, leaving some whole, and allow to cool. When the blueberry mixture has cooled, combine it with the Greek yogurt in a bowl. Beat the cream with an electric mixer until peaks form. Gently fold the whipped cream into the berry and yogurt mixture, leaving noticeable swirls. Separate into four single-serve dishes. Serve immediately or allow to set in the refrigerator for 1 hour before eating. Feel free to substitute other fresh berries as available, or to combine the blueberries with strawberries, raspberries, or blackberries to taste. Fresh berries not in season? Substitute frozen berries in equal amounts, but omit the added water in the first step.